Depression is a disturbance in which emotions of anguish, sadness, frustration, discouragement, etc., resulting from traumatic events experienced in the past, from which there is difficulty in being released. Often, experiencing certain experiences creates emotional conflicts that leads to depression. Hypnotherapy is a natural, innocuous technique that makes use of various techniques to identify what may have contributed to the development of depression, shows new paths and enables change. This change processes from the inside out, is a discovery through an introspective process, hypnotherapy helps the person to recognise that success and defeat are part of the history of every human being. Hypnotherapy allows you to experience these experiences, the client is sure to have the internal resources needed to make the change, while also allowing them to devise strategies to live life in a more harmonious and peaceful way. Depression is characterised by a large amount of symptoms, although it is evident that everyone is different, also the symptoms will not arise in everyone in the same way. Some of the symptoms of depression are listed below. From the point of view of conventional medicine it is accepted that some of these symptoms can be caused by various types of chemical changes occurring in the brain, namely deficiencies in the levels of serotonin and dopamine, whether due to the low production and release of these neurotransmitters or by excess reuptake. 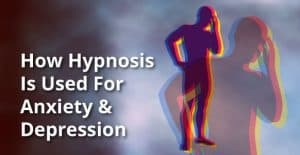 The function of hypnotherapy will then be to locate inner conflicts and their origin, preferably through techniques using hypnosis and eliminate them, by reinforcing the perception and understanding of these limiting blocks and beliefs, which promotes the liberation of the mind. The next step will be to reinforce self-esteem and a more optimistic vision of the future through the use of post-hypnotic suggestions. Can I lose control during hypnotherapy? DEFINITELY NOT. No one can hypnotise you against your will just like you cannot be forced to do or say something you do not want. You have the freedom to reject any suggestions at any time during the session. Contrary to the published image of hypnosis, often transmitted through books, films and television, the hypnotic process does not deprive the individual of the control of his/her behaviour. People remain conscious about who they are and where they are, and, most of the time, they can remember the whole procedure. If you have any questions or queries please do not hesitate to get in touch.